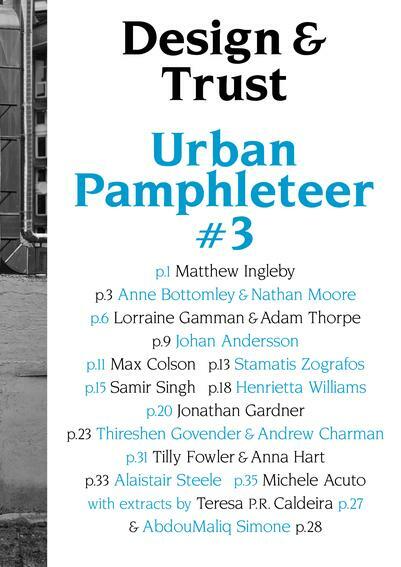 The third edition of the Urban Pamphleteer has launched and is now available to download as a pdf. Design & Trust launched during Cities Methodologies 2014 on Thursday 30 October in an event hosted by series editors Ben Campkin (UCL Urban Laboratory) and Rebecca Ross (Central Saint Martins College of Art and Design), and including a number of this issue's contributors presenting their own research and take on the theme. The issue questions the role and effects of security-driven spatial design, and raising this generally side-lined perspective of physical architecture as a strategy in crime prevention and surveillance. With a focus on specific designs or spaces, the contributors address contested sites and tensions created within public environments; from obvious and apparent devices such as city railings described by Matthew Ingleby, to invisible or ambiguous techniques, as explored photographically by Max Colson and drawn on also by Alistair Steele in his article on ATM cashpoint design. Depicting designs and spatial manipulations as both securing and controlling the public and their actions, contributors tackle the effectiveness of such strategies, and also point towards the idea of a need for new design strategies based on trust as opposed to distrust. Inviting dialogue and debate around incentives of such spatial and architectural design and its intended shaping of the public, the Design & Trust issue raises important questions around public space as shaped by strategy, and ultimately physical design as having powerful, sometimes subversive implications upon our daily actions and navigations in space. Contributors include: Matthew Ingleby, Anne Bottomley & Nathan Moore, Lorraine Gamman & Adam Thorpe, Johan Andersson, Max Colson, Stamatis Zografos, Samir Singh, Henrietta Williams, Jonathan Gardner, Thireshen Govender & Andrew Charman, Tilly Fowler & Anna Hart, Alistair Steele, and Michele Acuto. The other editions of the Urban Pamphleteer are available to download on this page.